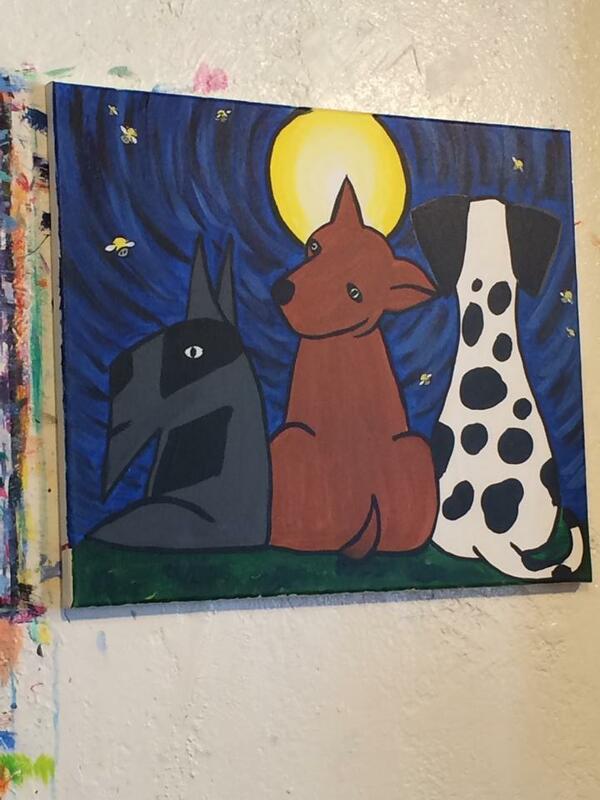 My 10-year-old daughter, Sofia, and I participated in Creative Juice Art Bar‘s fundraiser for the Humane Society of Southern Arizona on Saturday. It was a lovely workshop, with all the paint, canvas and creative juice (aka, beer and wine) one might need to find inspiration. 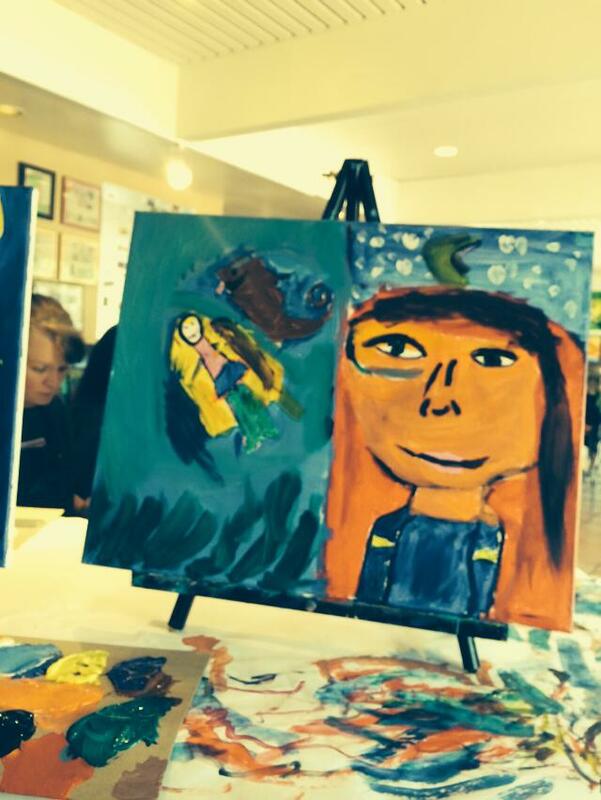 But that’s not quite what Sofia and I painted. I’d never been to the Creative Juice Art Bar before and didn’t know what to expect. I’d read on their web site that you can paint your own ideas, too, but when I asked the instructor if we could get started, she seemed a little taken aback. “I’m going to get started in a few minutes,” she said. I took that to mean we were supposed wait. I was fine with that…until I looked over at my daughter, who was bouncing up and down in her seat, a ball of barely contained excitement. Fearing a full on convulsion, I green-lighted her to get started. She snatched up the three brushes that had been provided and gasped, “Which one should I use?” This was not a question for me, but rather herself. She inspected each one, weighed the pros and cons, then selected the mid-sized brush — not too big, not too small. Without even a hint of hesitation, she plunged the brush in a daub of orange paint and got to work, her hands a flurry of motion. She quickly had paint on her face and in her hair. As class participants dutifully followed along with the teacher, outlining the hound dogs then filling them in, Sofia paid zero attention to anything other than her own canvas…and mine. When I wasn’t looking she’d add touches to it. In black paint. 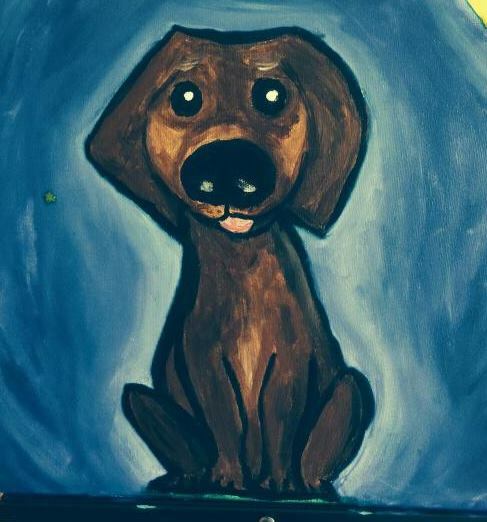 As you can see, Sofia did not paint hounds. Not even close. I’ve never been so open or just plain happy about my own artwork. I’ve always been able to draw a little, but I’m not some great talent, and I’m not very good at painting. Most of my artistic efforts wind up in the trash bin because I grow so frustrated with my inability to paint or draw like an Artist with a capital ‘A.’ In the process of mercilessly criticizing everything I do, I’d forgotten just how much fun I have drawing and painting. But spending an afternoon with my daughter painting just for the fun of painting and being creative and spending time together, I rediscovered that joy. Inspired by Sofia’s wild creativity, I, too, abandoned the lesson and painted something of my own creation. And it was so much fun. Going free range is so much fun.